Six of the most haunted houses in the U.S.
(MoneyWatch) Have you ever seen an eerie pale figure in the window or jerked awake because of a bump in the night? Apparently, nearly a third of Americans have. According to Realtor.com's Haunted Housing Report, 35 percent of respondents claim they have lived or are living in a haunted house. The report also provided some warning signs that a house could be haunted: A cemetery on the property, more than 100 years old, quick transitions in owners, an unexplainable low price or close proximity to a battlefield. Some of the most haunted homes in the country meet more than a few of those creepy criteria. Ed Kushins, a global travel expert and founder of home swapping site HomeExchange.com, offered up a list of six of the most haunted homes in the country. Most of these aren't for sale, but you can at least step inside the haunted, historic abodes. A few even offer the ability to stay overnight and sleep in the same rooms where gruesome murders took place -- if you're into that kind of thing. LaLaurie Mansion in the French Quarter was home to Dr. Louis LaLaurie and his wife Delphine beginning in 1832. Known for lavish parties, they were among the most respected members of the community. But they had a dark and horrible secret: An attic torture chamber where Madame LaLaurie performed ghastly and often fatal medical experiments on slaves. The souls of the tortured, particularly that of a young girl, are said to appear regularly and cause owners great misfortune. Madame LaLaurie's reputation continues to attract visitors to the spooky home, and it's likely more will come after seeing actress Kathy Bates play the role this season on FOX's "American Horror Story." The home itself is owned by investors now, after its most recent owner, actor Nicholas Cage, lost it to foreclosure after purchasing it in 2009. The famous Civil War battle at Gettysburg was one of the bloodiest in its four-year history. Farnsworth House, named for Brigadier General Elon J. Farnsworth, was home to Confederate sharpshooters during the conflict and acquired at least 100 bullet holes as a result. It later operated as a makeshift hospital, and currently functions as a 10-room bed and breakfast. Fourteen ghosts are rumored to haunt the premises, including a midwife called Mary who likes to comfort guests by sitting on their beds. Joshua Ward House, Salem, Mass. This brick mansion was built for merchant Joshua Ward in the 1780s on a foundation that had previously been owned by Sheriff George Corwin. Corwin, who became known as "the Strangler," was responsible for the killing of many accused witches during the Salem trials of the 1690s. The spirits of his victims are said to still reside in the house today. Dock Street Theatre, Charleston, S.C. The building that stands on Charleston's Church Street today is not the original Dock Street Theatre, though it may be haunted by some of its original actors and theater-goers. It is unclear what happened to the first structure in the 18th century, but Christopher Parham, Dock Street's managing director, told the Charleston City Paper that many assume it burned in a fire that claimed other buildings in the area. The Planters Hotel was built in 1809 to replace the building, and it became a theater again in the 1930s. The most sighted ghost at Dock Street is that of Junius Brutus Booth, an actor and father of President Lincoln-assassin John Wilkes Booth, who stayed at the hotel and is said to return to watch rehearsals from the balcony. Boone Hall Plantation, Charleston, S.C. The Boone Hall Plantation, founded by Major John Boone and then sold to brothers John and Henry Horlbeck, is another place supposedly haunted by the ghosts of slaves. The brothers expanded the property's brickyard and set some of their 225 slaves to work operating dangerous kilns for the local building industry beginning in 1817. According to legend, the numerous spirit sightings at the plantation have all occurred within 20 feet of the kiln, and a slave girl and slave boy are the most commonly spotted. 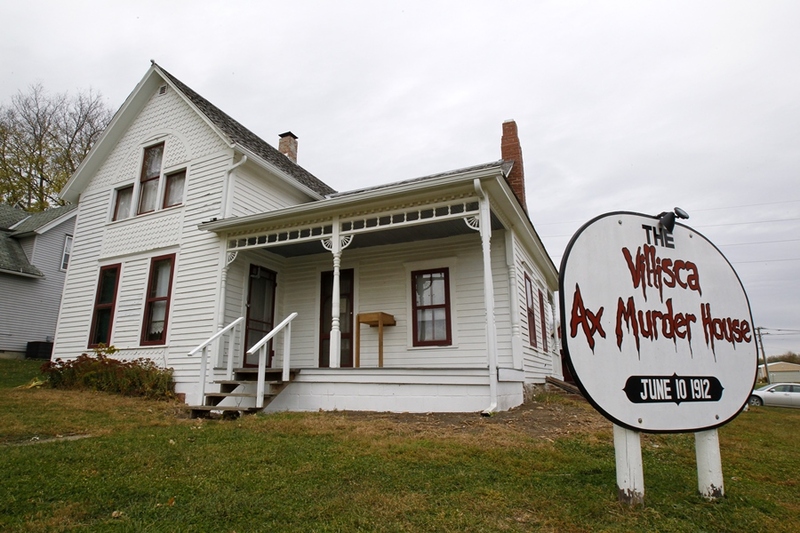 Guests have the opportunity to stay overnight at the Villisca Ax Murder House, but only if the stories don't scare them. The brutal 1912 murders of six children and two adults in the home of J.B. and Sarah Moore were never solved. All members of the Moore family and their two guests were found in bed with an ax wound to the head -- and very little other evidence was ever found. To this day, paranormal investigators and novices report hearing the sounds of children crying, lamps falling, ladders moving and doors slamming on their own.